« What to do with broccoli? What to do with too many pears? Pear bread: It sounds simple, or even a bit odd, but this recipe will win over any skeptics! It’s nicely spiced like carrot or pumpkin bread but the pears make it extra-moist and a bit sweet. You’ll find yourself making excuses to eat some at any and all times of the day and you’ll make some life-long friends if you give a loaf as a gift. Upside-down pear cake: If you’ve never made an upside-down cake, this is a great place to start. The fan shape made by the pears is easy to do but looks quite impressive – like a tarte tatin but without the effort of caramelising the fruit or the guilt of all that puff pastry! A simple dish that deserves a place at your next dinner party. 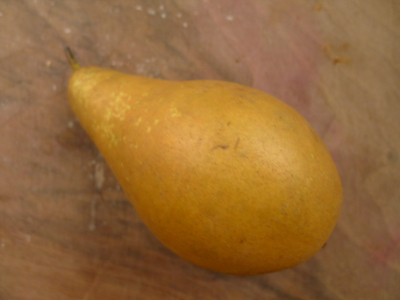 Poached pears: After watching countless ‘Come Dine with Me’ hosts poaching pears for dessert, I had to give it a go. It is really simple and there are infinite variations to try – this post from David Lebovitz gives loads of top tips and suggestions to get you going. Latkes with pear sauce: Traditionally, these Jewish potato pancakes are served with applesauce and/or sour cream, but I’ve substituted half or all the stewed apples for pears and had equally delicious results! Preserves: Pear butter is one handy preserve to make with gluts of pears. It will keep well so you can put it aside for use as a filling for cakes or even as a sauce like in the recipe above… Or check out my recipe for pear and chilli chutney below. Combine all ingredients. Cook over medium heat in the widest pan you have. You want a shallow layer of chutney so avoid using a deep pot and, if necessary, cook the chutney in batches (this will prevent long cooking times which can damage the final texture). The chutney is ready if you can run a wooden spoon through it and the spoon’s path remains visible for a few seconds, without liquid flowing back in. 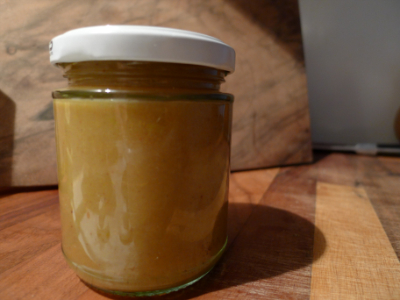 Spoon into hot, sterilised jars* and store for at least 6 weeks before eating to allow the flavours to mature. *I sterilise my jars by first washing in warm soapy water (a good soak should also make it easier to remove any labels, the back of a bread knife is a good tool for scraping off any remaining bits of glue). Then I boil the jars and lids for 10 minutes. I then place the jars in a 150C oven for at least 20 minutes and until they are dry. Make sure to fill and seal while they are still warm.